While leadership development earns a top spot year after year after year on organizations’ talent priority lists, 36 percent do not have a formal leadership development strategy, according to 2015 Brandon Hall Group’s State of Leadership Development Study. Leadership development stands tall as a clear and continuing human capital concern. Building better alignment between leadership development solutions and business needs, developing high-quality leaders faster at all levels, and utilizing true leadership analytics to drive predictive decisions about future-oriented leadership capability and acuity are clear business needs. High-performance organizations have figured out the configuration of those needs to best meet their business goals, but they are among the minority. While most have been pressing the leadership accelerator for several years, just a few have made significant progress. 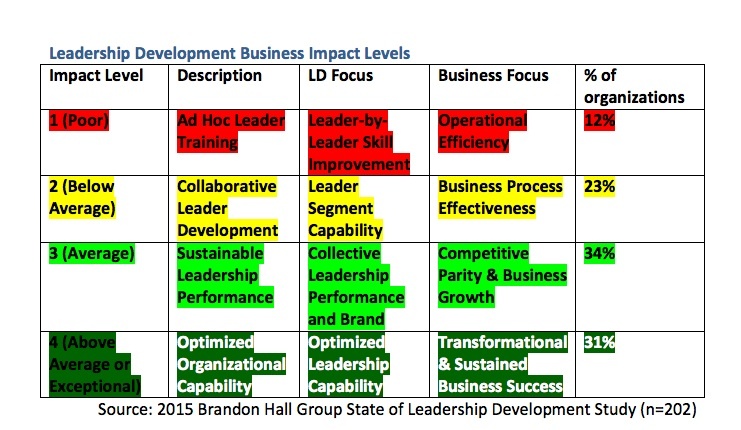 More than one-third (36 percent) of organizations surveyed in Brandon Hall Group’s State of Leadership Development Study, concluded in April, say their leadership development practices are still below average or poor. Another third (34 percent) say are only average, and 31 percent report their practices as exceptional or above average. That latter statistic is actually a fairly impressive increase (21 percent) over 2013’s scores where just 25 percent were above average exceptional, or what we call high-performance Level 4 organizations. This data serves as a strong reminder that leadership development is a strategic and long-term business imperative, not short-term training. For those who treat it as such, we can expect it to yield better business results and serve as a real business differentiator. 1. Requirements for good leadership are infrequently defined. Effective leadership development requires alignment with business goals, and alignment requires careful definition of the capability, skill, and experience requirements essential for an organization’s leaders. 41 percent of organizations recognize the critical importance of defining leadership requirements. 8 percent have taken the time to define their unique leadership requirements. It is no surprise, then, that organizations cited alignment as the third (behind only limited budget and limited time to participate in development) greatest barrier to effective leadership development. 77 percent or organizations indicated that their leadership strategy was only somewhat, or not at all, aligned with their business strategy. 2. Deficit of leaders with high-quality skills is a global concern. While leadership development earns a top spot year after year after year on organizations’ talent priority lists, 36 percent do not have a formal leadership development strategy. 51 percent of organizations said their leadership is not at all ready, or only somewhat ready, to lead their organizations today. 71 percent said their leaders are not ready to lead their organizations into the future. When asked why, “proactively managing leaders’ skill gaps” was the No. 1 reason and cited as the most critical priority for improving leadership development by 57 percent of organizations. Coaching was identified as the skill with the greatest gap in all leaders. 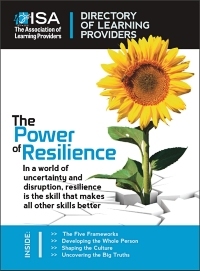 Communication, resiliency, critical thinking, collaboration, and data analysis also were identified as the five skills most essential for all leaders and with a significant gap in mastery. Another troubling finding is that the majority of organizations (84 percent) reported a current or anticipated (within the next five years) shortage of leaders. With this prediction looming, it is no surprise that “managing gaps in critical leader segments” was cited by 46 percent of organizations as the second most critical priority for improving the leadership development process. Leadership shortfalls are, and will continue to prove to be, the single greatest differentiator between high-performance and all other organizations. 3. Improving leaders as development coaches is top priority. A leader skilled as an effective development coach is a recurring and critical leadership development need. In Brandon Hall Group’s 2015 State of Performance Management Study, 64 percent of organizations advised that developing leaders to be effective coaches was the single greatest opportunity for improving and sustaining employees’ performance excellence. The theme repeats itself in the leadership development study, in which 81 percent of organizations indicated that their leaders are not at all, or only somewhat, effective at developing their employees. 57 percent of all organizations advised that their top priority for improving leadership capability is developing leaders to be effective development coaches. 4. Developing leaders at all levels is still an opportunity for most. 83 percent of organizations surveyed said that targeted development for all leader levels is important or very important. 5 percent have implemented solutions for all levels. Even organizations with well-functioning solutions identified their mid-level leader solution and individual contributor leader solution as least effective among all levels. Considering the broad span of control of most mid-level leaders and the volume of individual contributors with high potential to move into supervisory positions, it would serve organizations well to focus dedicated time and resources to growing the effectiveness of the solutions for these two leader levels. 5. Leadership development spending rising again. 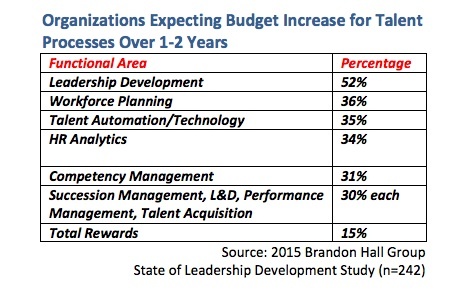 While leadership development was ranked third in investment among talent processes (behind only learning and development and talent acquisition), it was cited by more than half (52 percent) of organizations as the talent process that will receive the greatest increase in talent budget allocation over the next 12 to 24 months. Acquiring predictive data capability to enable future-oriented leadership requirements and decisions. Regarding predictive capability, 34 percent of organizations plan to increase their budget on HR analytics. Specifically, leadership analytics will enable the knitting together of leadership data with other talent process data and allow forecasting of answers to what-if leadership scenario planning. For example, this data could address how proficient a critical leader segment is today and how proficient do we forecast its proficiency level in five years if we add 100 leaders to staff in the next six months. Or how many leaders are effective development coaches today and how many will we need to be proficient if we proceed with the acquisition of Company ABC, etc.? 67 percent of organizations indicated that the integration of leadership data with other talent data was very important or important. 82 percent advised that the data was integrated to a very small degree or not at all. Laci Loew is vice president and principal analyst for Talent Acquisition for Brandon Hall Group, a human capital management research and advisory services firm that provides insights around key performance areas, including Learning and Development, Talent Management, Leadership Development, Talent Acquisition, and Workforce Management.